Study of Contours is generally referred to study of undulation in the flat surface. Each contours is defined by the joining of all the contour intervals along the same plane. 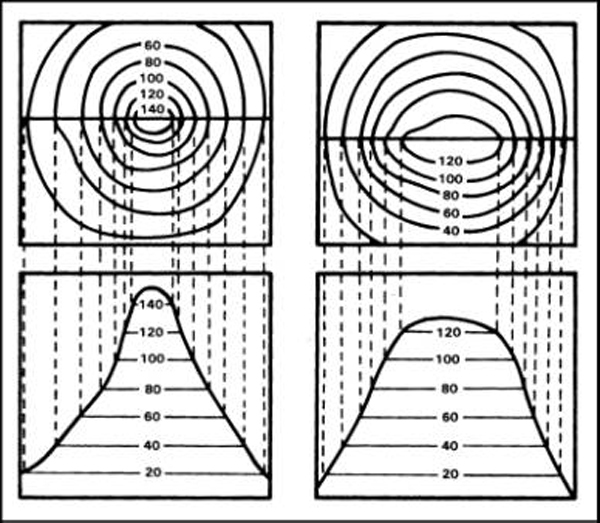 1) Nature of ground – In flat or uniformly sloping countries, contour intervals are kept small while in steep or broken countries, contour interval are kept larger. 2) Purpose and Extent of Survey:- For survey of small areas, smaller contour intervals are kept while wider intervals shall be provided for larger areas. 3) Scale of the Map:- Contour interval is inversely proportional to the scale which means smaller the scale, greater is the contour interval. 4) Time/expense of work:- Contour interval is inversely proportional to the scale which means smaller contour intervals require more time for the field work and plotting or smaller the contour interval, greater is the field work. – All points on a contour line have same elevation. – In Flat grounds contours are widely separated while in steep grounds contours are close together. – In case of Uniform slope , contour lines are uniformly spaced while in case of plain surface, lines are straight, parallel and equally spaced. – In hills, higher values of contour lines are inside. – In valleys, higher values of contour lines are outside. – Contour lines cannot cross or merge one another except in case of a hanging cliff. – In case of vertical cliffs, the contour lines run into one another and in this case contours intersect and horizontal equivalent becomes zero.